Marriage, mutual submission or something else? Marriage, mutual submission or something else? I think it is something else. I think to say that, “you mutually submit to one another” misses the bigger picture. I think it is as the Bible says. The wife should submit to her husband, like the church submits to Christ’s authority. The husband should submit to God. Even if it means dying. This is like the submission of Jesus to the Father’s will. 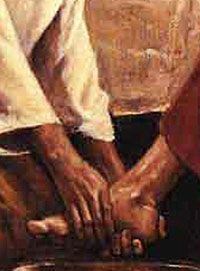 If we remember from scripture, Jesus washed the feet of the disciples. Jesus, who is God incarnate, left the majesty of His estate to dwell among us in mortal flesh. He bore the punishment of the sins of those who would be saved. He submitted to death on a cross. Wouldn’t you rather have a husband love you like that, than one that simply, mutually submits to your imperfect human will?